Scarlets and Wales fly-half Rhys Priestland has been linked strongly with a move to Bath. The 27-year-old says he has decided on his future and reports claim Priestland will join the English Premiership side after the 2015 World Cup. 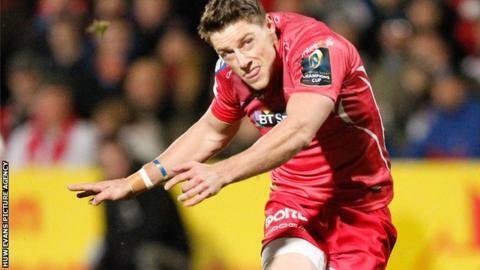 Priestland is out of contract at the end of the season and has held talks with Scarlets about a new deal. "Everything's sorted and I think I need to come out this week and put everything to bed," said Priestland. Bath head coach Mike Ford would not comment on Priestland in the wake of his side's 17-8 defeat at Leicester on Sunday. A day earlier, Priestland spoke after being named man of the match in Scarlets' 22-10 Pro12 win over Ospreys. "To be honest, I've enjoyed my rugby for the last few months," he added, speaking to Sky Sports. "People have jumped on this bandwagon of me playing well in the last two or three weeks. "But I think the performances have been pretty good pretty consistently." "Rhys has been outstanding in the last couple of matches. He controls the game really well and he's a leader and everyone looks up to him. I enjoy playing alongside him and he's a very positive player and he's just getting better and better." Scarlets head coach Wayne Pivac has said previously the region are eager to keep international players such as Priestland. Asked about the fly-half's contractual situation, Pivac wants Priestland to take his time as he mulls over his future. "What we don't want him to do is rush into that decision," said Pivac. "We want him to just be 100% committed to the decision that he does make, and we'll support him either way. "The sooner we can make announcements, the better it is for everyone. We can all move on. "He's been around a while and he's done great service to the club and great service to Wales. So we want to make sure, whatever he does, he's 100% committed."